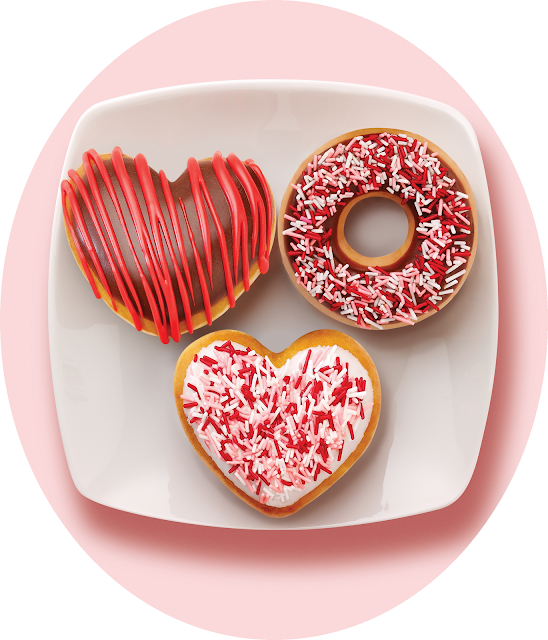 Celebrate the season of love with Krispy Kreme’s irresistible iced, drizzled and sprinkled heart-shaped treats. Available for a limited time at participating Krispy Kreme U.S. and Canada shops. What better way to say, 'I love you', than giving your partner the gift of the doughnut? Before you answer that question, I'm just going to help you out a bit– there isn't! To me, this gift shows me that the person who gifted it wants you to enjoy a day full of satisfaction. Available through February 14, Krispy Kreme is offering these sweet one-of-a kind treats to share with your special Valentines. Pair them with any Krispy Kreme Signature Coffee Blend and it’s a recipe for love. Nothing says ‘Be Mine’ like a decadent chocolate iced doughnut drizzled with red icing. Treat your sweetheart to a heart-shaped treat topped with white icing and romantic red and white sprinkles. A classic chocolate iced doughnut showered in red and white sprinkles for your true love. You get the point, right?! Send your sweet love a Krispy Kreme Valentine e-card at www.krispykreme.com/card. And, watch Krispy Kreme’s video Valentine to its fans at www.krispykreme.com/SpreadTheLove. Get twelve FREE Valentine Cards when you purchase a dozen doughnuts. Each Valentine card is good for a FREE doughnut of choice for you or for your Valentine. Offer good for one set of twelve cards per dozen purchased. While supplies last. Krispy Kreme’s heart-shaped and original glazed doughnuts are also available in assorted varieties and specially designed Valentine’s Day packaging at participating grocery stores, convenience stores and mass merchants. Visit www.krispykreme.com/grocery for details. Products may vary by market. In Maryland, we have a ton of locations that sell Krispy Kreme doughnuts, but no retail locations. I could just head over to Washington, D.C. or VA, but I'd much rather show some love to my readers. This giveaway has nothing to do with the Valentine's Day promotion mentioned above!! Just leave a comment on this post telling me what your Valentine's Day plans are. (1) person will win a Krispy Kreme Partnership card that is good for 10 FREE DOZEN ORIGINAL GLAZED. You must buy a dozen to get a dozen free. Maximum daily redemption of 3 FREE dozen, with a purchase of 3 dozen at regular price of course. Valid at participating Krispy Kreme RETAIL stores only. Check to see if your state has one here: http://locations.krispykreme.com/. Please leave a valid email address or form of contact when commenting. Winner will have 48 hours to respond. Giveaway ends on 2/13/2012 at 11:59 PM EST. www.krispykreme.com, www.KrispyKreme.com/HotLightApp , www.KrispyKreme.com, Facebook, foursquare and Twitter, and KrispyKremeDoughnuts on YouTube.